Need Regular Price Quote? See Below, Just Scroll Down! Go Mini’s Makes Mobile Moving and Storage Simple! 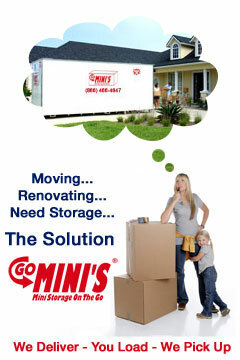 Go Mini’s Portable Storage provides an easy and affordable alternative to traditional moving and storage companies. Our mobile mini containers are clean, strong, and dry. The moving containers can be stored at your location or at our Louisville storage facility. Go Mini mobile moving containers are portable and maneuverable allowing flexibility for placement at the delivery site. Storage of your Go Mini Moving Container at our Louisville storage facility provides a secure alternative to storing the mobile unit at your Louisville location. Use your lock to secure the container and access the portable storage box on demand during regular business hours. If you live in the Louisville, KY and southern Indiana region (including surrounding cities and counties), simply call Bob Jones to have a portable container delivered right to your door. We are locally owned and operated so you can expect personalized, prompt, and courteous service. Go Mini Prices– Choose Option 1, 2 or 3 ! Choose this option if you want a Go Mini delivered to your home or business and then have the empty container picked up when you are done with it. 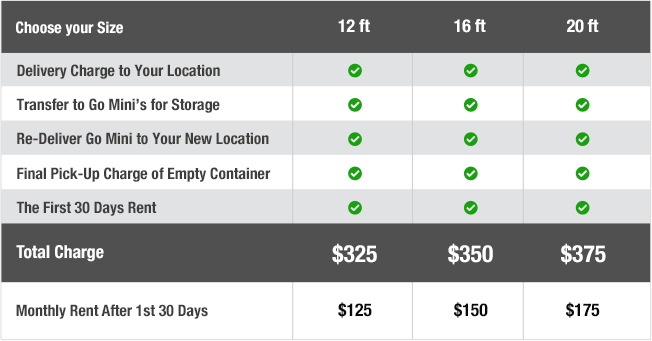 Choose option 2 if you want the storage unit delivered to your first location and then transferred (full) directly to your new location. Empty unit would be picked up when finished. 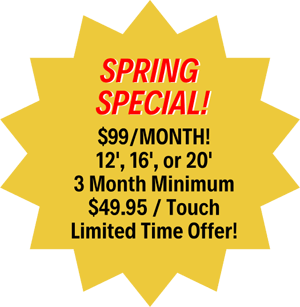 Store at Go Mini’s Louisville Location – Winter Special! Choose Option 3 if you want the unit delivered to your home, then have full unit transferred to Go Mini’s Louisville for storage. When you are ready, we will re-deliver the full unit to your new home! All at your convenience! Reduced Price For Limited Time! Make Reservation Now To Lock In Price ! The charges above are for delivery within the Louisville area. Call or E-mail us for a quote on charges outside of the Louisville area. Typically, we do not handle moves beyond 100 miles. Our popular 20 foot container offers 25% more storage capacity than our competitors’ largest container. Our all steel container with a smooth, white, marine grade painted all steel interior provides a clear choice when compared to a rough, plywood interior. Go Mini’s are clean, dry and secure! Monthly rent is the same whether you store the Go Mini at our location or your location. If you need assistance with loading/unloading, Go Mini’s can provide you with a reliable source for professional packing and loading labor. We rent quilted moving blankets for $1.50 each per month. Secure your Go Mini with a standard pad lock, $12.50 each. Portable Storage Containers Can Provide The Perfect Solution! Traditional mini storage or self-storage in Louisville, Ky requires truck rental and double loading and unloading. 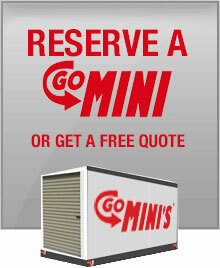 Loading a Go Mini mobile self storage unit is easier requiring less handling (load once, unload once). Because it is ground level, there are no steep ramps to go up like there would be while using a rental truck for moving. 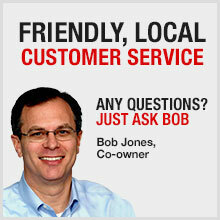 We wish to show our gratitude to Bob Jones and GoMinis by offering this recommendation. Bob did a great job of working with our hectic and ever-changing schedule to make sure the container was delivered and picked up at just the right time. Even though we had to delay and reschedule several times, Bob was completely understanding and able to fully accommodate our needs. Bob definitely had our best interests in mind. He helped us make sure we picked the right container size for our property, he recommended helpful movers who got things finished quickly and inexpensively, and he even made sure that our insurance policy still covered our property. We highly recommend GoMinis over other portable storage container companies and we will definitely use them again in the future! Go Mini’s has a sister company called Moon Dumpsters that provides 6, 9, 12 and 16 yard roll-off dumpsters for rent in Louisville, Ky. We deliver our roll-off dumpsters on small trucks with a hook-lift which enables placement of the dumpsters in hard to reach areas. Moon Dumpsters are perfect for home remodeling projects and general home clean-up projects. 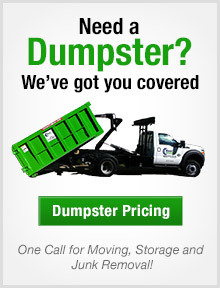 Click here to go to Moon Mini Dumpster’s web-site Dumpster Rentals Louisville KY.